My gauge has loosened up a lot since the last time I did one of these dishcloths. This is a really good thing. I have been having some issues with my right wrist and the most painful thing is pinching and rotating at the same time. Pinching (to hold the hook) and rotating is pretty much how I was crocheting and the pain was one of the reasons I had not crocheted since last October. The tightness of my stitches, especially the foundation chain, contributed to this problem and slowed me down a lot. I’m getting much better at holding the yarn. I wanted to learn to crochet for two reasons. One is that there are projects, especially toys and blankets, that seem like better crochet projects than knitting projects to me. But the more important reason to me was that I wanted to learn to hold yarn in my left hand. I knit English / American style, so I hold yarn in my right hand and throw it. I have wanted to learn Continental (picking) for some time. My problem has been figuring out how to the hold the yarn. I seemed to be constantly adjusting the yarn in a way that was distracting and slowed me down a lot. I have too many projects to knit to be slowed down! I know that many crocheters pick up Continental style quickly because the yarn hold is very similar. I thought that by detouring into crochet on the path to Continental, I might find it less frustrating because it is an entirely new craft that I don’t expect to be able to do with any speed. Once I can crochet with some proficiency, I will try Continental again. Then I can do two-handed color work, something I have not attempted and that I would like to learn. I still have work to do with holding the yarn while crocheting as I still have to adjust it regularly. But it isn’t every stitch, like it was before. Sometimes, I even managed an entire row! I really like pointy crochet hooks. When I crocheted before, I was using plastic hooks I got at a big box craft store ages ago. I mostly used those hooks to help me fix dropped stitches in my knitting, and they worked fine for that purpose. I made this month’s granny squares and dishcloths with hand-turned hooks by Sistermaide that I purchased at The Fiber Event in Greencastle, Indiana in April. These hooks are really pointy. This helps with getting the hook through cotton, which can be so splitty and unyielding. It should not surprise me that I like pointy crochet hooks, as I am also a huge fan of pointy knitting needles. I just had not given the matter any thought since I am such a new crocheter. I might need to use a thimble when crocheting for long periods of time. Crochet hooks make more contact with my finger than knitting needles do. Pointy hooks are great for getting through yarn, but it isn’t a lot of fun to repeatedly poke your finger with a pointy object. I am going to look at different finger-protecting mechanisms and find one that will not be so bulky as to interfere with crocheting. If any readers have recommendations, I’d love to hear them! You noticed that? It is the reason for the spoiler alert on this post! Late last year, I came up with the idea of making some of my family 25 dishcloths each and gifting them as an Advent calendar. I will roll up each one with the wrong side showing and tie the two ends in a manner that looks like a Christmas cracker. I may include small gifts or candy inside them. One will be opened on Thanksgiving, along with an explanation, and the rest will be numbered 1 – 24, and opened one per day as an Advent calendar. I came up with this idea late last year, after Chris (my husband; I don’t think I’ve mentioned his name on the blog before!) commented on how much he liked my hand-knitted dishcloths because they were so sturdy and good for scrubbing. 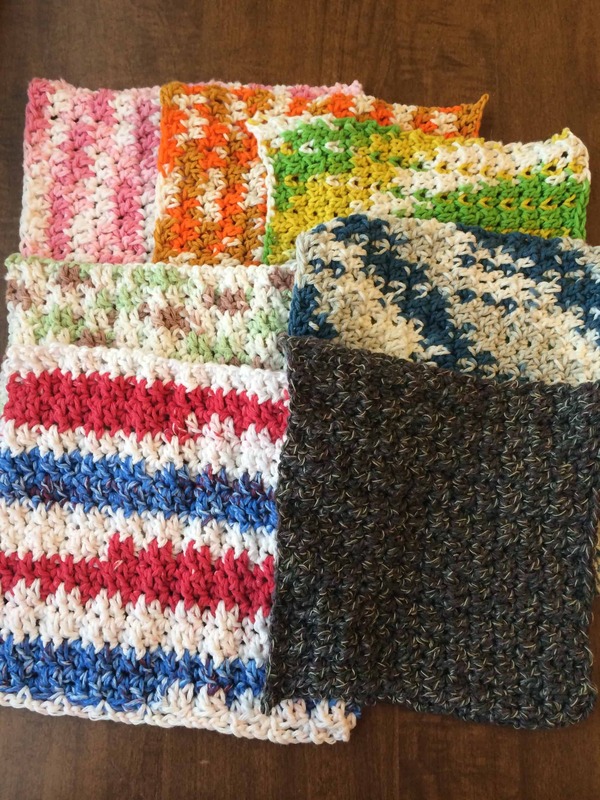 To non-fiber crafters, the idea of making dishcloths probably sounds crazy, but once you use one, you understand why you might want to make them. Everyone should have handmade dishcloths! Because they are awesome! I could make a pile and just give them in one shot, but why not do something fun? Dishcloths can have so many different patterns and pictures. It was the holiday season, so my mind immediately leaped to the idea of Advent Calendars. The biggest problem with this project is that it is really big. There’s 10 people on my list. That’s 250 dishcloths. And I need to have enough time to assemble the advent calendars, so I need the knitting and crocheting to be done by the end of October. Since I only have about 30 dishcloths completed so far, I really don’t think it is going to happen for this year. It will probably be something that I give in 2015. I do have a Ravelry project just for the Advent Calendar. I usually make separate projects for each dishcloth, then add the pictures and links to the individual project page to the Advent Calendar project.